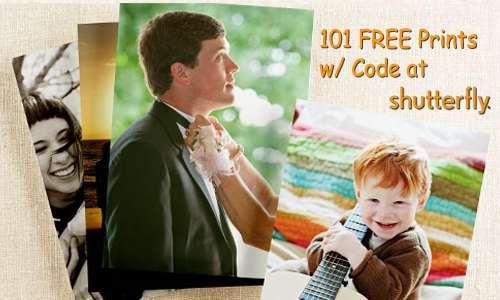 A Shutterfly coupon code for 101 Free 4″x6″ photo prints is back! Upload your favorite photos from the past month, enter the code LOVE101 and only pay shipping. I’ve seen a ton of Easter Sunday pictures posted online, so I’m sure your camera is full of possible (FREE) prints. This Shutterfly deal has consistently popped up, so we can count on it for all the pictures we will take this Summer as well! Shipping for 101 prints is $7.99; but if you only order 99 prints, shipping will drop by $2 to $5.99! That makes it 6¢ a print which is a great price.